You are here: Home / Articles / Your pet’s food | what’s in it, why does it matter & which one should you choose? We all realise that not all food is equal. Our food varies in its price, nutritional content and quality. It’s the same for our cat and dog food too, the difference being that our pets are reliant on us, their humans, to choose what they eat. whether or not our pets seem to enjoy it. Occasionally we may look at the actual ingredients (some owners are moving towards raw food recipes – we’re not covering this in this blog) but many of us don’t look past the main ingredient listed, e.g. Chicken, Tuna, Duck etc. You may already be one of the owners who have realised that certain foods can benefit your pet’s health, helping to ease medical conditions and helping to keep them happier for longer. This, and good general nutrition is something we think everyone should know about, so this blog looks into the benefits of premium cat and dog food and explains what you should look for when choosing your pet’s food. 91% of vets* agreed that commercially prepared pet food provides optimum nutrition for cats and dogs when fed correctly. Just over a third, 35% always read the ingredients. As with all foods, commercial pet food ranges from good to better to best and here’s what you should look for when you make your choices. Named animal protein – Good foods will name the source of the protein, e.g. lamb, beef, fish, chicken etc. Supporting animal meal (when fresh meat is listed first on the list) – this additional source of protein from animal meal (skin/bone/tissue) contains a lot of protein and supports the initial protein source. Again you should looked for named meal such as beef meal or chicken meal rather than just “animal meal”. Vegetables, fruits and grains – fresh and unprocessed foods supply cats and dogs with natural and complex vitamins, enzymes and antioxidants, but should appear lower down the list, rather than up there as a main ingredient. Tip: Check for ingredients that are split down, but as a whole add up to be a big percentage of the diet – for example “brown rice 20%”, “white rice 20%”, “rice bran 10% – suddenly rice is representing half of the recipe. Additional oils, minerals and vitamins – certain recipes are developed to contain more nutrients for specific reasons. Read the ingredients to see what benefits each brand contains, some may have more beneficial additions than others. Best before dates – ideally look for dates more than 6 months away, this will indicate it’s been made recently. Advice: Do not try to compare protein levels between dry and wet food recipes. Dry food seems to have more in it because the protein is concentrated into smaller amounts of food and your pet eats less of it. 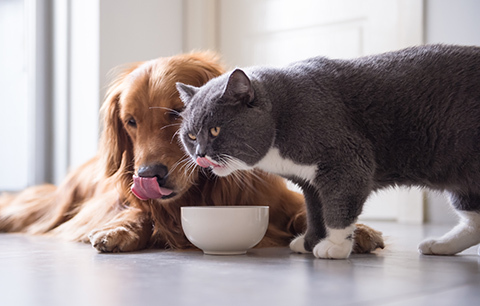 Wet food has more moisture, so pets eat more to feel full, and while protein levels are not as concentrated, by the time your pet has finished their meal, if they’re eating the correct amount, they too should have received the correct level of protein. As well as general foods, there are specialist/veterinary diets, some of which are ONLY to be given to pets following the advice of your vet. Various manufacturers have spent years researching and developing bespoke diets that are purpose made to help cats and dogs with common medical conditions. Royal Canin and Hills are just two of the big name brands with extensive ranges of specialist diets. Whether it’s lowering the calories, increasing or changing the vitamins & supplements, improving the digestibility for example, each recipe aims to support animals and help them maintain the correct amount of nutrition for their medical condition. Warning: – NEVER change your cat or dog’s food over to a veterinary diet unless you have received advice from your vet. It could make your pet unwell. Although a good nutritious food which is suitable for your pet’s age should keep your pet in tip-top condition, there maybe times when you wish to supplement their diet to help give extra support. You can buy supplements for a wide range of conditions, some of the most popular being dog skin care, sensitive digestion and mobility and cat urinary, skin care and joint support. Now you have some knowledge in knowing what to look for when you read your cat or dog food label, choose the best that you can afford and if your pet does have a medical condition, talk to your vet about a possible veterinary or prescription food. Don’t forget, Animed Direct sells a huge range of dog and cat foods, (including prescription only diets) at vastly reduced prices. Here’s just a taster (no pun intended) of some of our leading brand foods and supplements.